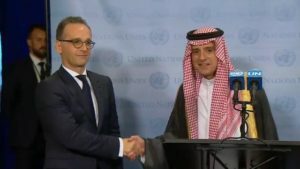 Saudi Arabia and Germany Tuesday agreed on the sidelines of the UN General Assembly in New York to turn the page of dispute and to bolster cooperation. Both countries fell apart following November remarks by then German Foreign Minister, Sigmar Gabriel, who qualified as “adventurism” the kingdom’s action in the Middle East, in reference to the Saudi-led action in Yemen against Iran-backed Houthi rebels and the surprising resignation of Lebanon Prime Minister Saad Hariri who stepped down while on a visit in Riyadh. Several Western countries believed Riyadh coerced him to resign. Saudi Arabia rattled the remarks and pulled out its ambassador, indicating that it was not ready to take reprimands. Consequently, German companies have been reportedly barred from bidding for contracts in the kingdom. Last month, European and U.S. pharmaceutical associations waded into the diplomatic dispute, warning that restrictions on German-made drugs could hurt Saudi patients and dampen future investment in the kingdom, Reuters reports, adding that German Chancellor Angela Merkel has been working on mending the ties. Tuesday, German top diplomat Heiko Maas and his Saudi counterpart Adel al-Jubeir agreed to leave the spat behind and look forward with the return of their ambassadors. “In recent months, our relations have witnessed a misunderstanding, which stands in sharp contrast to our otherwise strong and strategic ties with the Kingdom of Saudi Arabia and we sincerely regret this,” Maas said. “We should have been clearer in our communication and engagement in order to avoid such misunderstandings between Germany and the kingdom,” he added. Jubeir invited Maas to visit the kingdom and affirmed “deep strategic ties” with the EU powerhouse. “The kingdom and Germany play a leading role in bolstering international security and stability and the global economy,” Jubeir said.